Wendy King with ETA Gordon Hendricks at the Flaming Star Festival. Photo Credit: Louis Young. The following article by Wendy King was written a couple of days after Gordon Hendricks’ concert at the LAC (Lincoln Alexander Centre) in 2016. Since it is the same concert that Collingwood ETA Judge, Rose Geoghegan, who was recently featured in SIDEBURNS Magazine, organized and ran, I thought it would be a nice follow-up to Rose’s interview. Wendy remembers introducing Gordon that night, and also remembers him saying that it was his first real theatre show outside England. ETA Gordon Hendricks performs a signature Elvis move at the LAC concert. Chatting with Wendy about her experiences that magical night and recalling the circumstances that led to me attending the same concert, in hindsight, seem almost surreal. I mentioned in Rose’s introduction that I bought one of two remaining tickets to what was fast becoming a sold-out show; but there is more to the story than simply handing over cash for a ticket for a must-see concert. It was an odd turn of events that led to my ticket purchase, and sitting here today at my laptop telling you this story, I know that fate had a hand in the events that would eventually change my life. ETA Gordon Hendricks poses with Carolyn at the LAC, July 16th, 2016. Photo Credit: C.M. I called the LAC box office to inquire about tickets for a rumoured Steve Michaels’ concert. I had been going to Steve's concerts once or twice every month since first seeing him in Return to Grace in September, 2015. I was understandably disappointed when the box office salesperson informed me that Steve was not performing any time soon. The salesperson added that, if I was interested, ETA Gordon Hendricks from the UK was performing on July 16th. (In my article, Keeping His Memory Alive, which is on my website, I explain my lack of ETA knowledge). The LAC box office salesperson added that the July 16th concert was close to selling out, and if I wanted to purchase a ticket, I would need to contact the promoter, Rose Geoghegan, right away. Just to be sure that it was a concert I would want to see, I thought I should check out Gordon Hendricks’ performances on YouTube. It took only a few bars of one song to convince me that I needed to purchase a ticket. I met Rose at McDonald’s Worsley Road and Hwy #8 location in Stoney Creek—located right at the end of the street where I grew up! I spent many happy days at #61 typing on my Tom Thumb typewriter, and the fact that Rose had selected this particular location for our meeting was a good omen, no doubt. Everything was working out as it should. 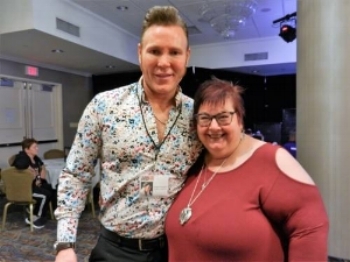 Carolyn poses with ETA Gordon Hendricks at the Casablanca Hotel, Grismsby, Ontario, October 29th,2016. What I remember of the evening is much as Wendy describes in her article. It was indeed a spectacular concert! I didn’t know Wendy at the time, but I remember Gordon giving gifts of pottery made in his home town of Trent-Upon-Stoke, and Wendy has informed me she was the recipient of a lovely Wedgewood clock that evening. I remember Gordon also gave Rose a gift that night, presumably, Wedgewood pottery. I also remember the young lady who danced up a storm on the stage with Gordon, and the woman who relentlessly took selfies while Gordon was performing. Her resolve to get the perfect photo of herself with Gordon was so excessive, that the audience booed her. If she had waited, she could have snapped some great photos after the concert. At the time I didn’t know why, since launching a magazine was not even in my wildest dreams, but I felt compelled to ask Gordon at his post- concert meet and greet, if I could interview him. He said we could do an interview in Collingwood while he was there for the festival. Sadly, I was unable to make the trip to Collingwood. But again fate stepped in. I would meet Gordon a second time in 2016 after a dinner/concert event that Sandra Gold organized, and once again we discussed the possibility of an interview. Again, Gordon said, “Yes,” but he was leaving for the UK the next day. Door opened; door slammed closed! Post interview photo with ETA Gordon Hendricks, October 19th, 2017. On November 13th, 2017, almost a year and four months since we first met, I posted my long awaited interview with Gordon Hendricks. I had launched SIDEBURNS Magazine months earlier, so I had a format ready for posting interviews and stories. My web manager and I bought tickets to the Flaming Star Festival with a goal of meeting new people, seeing new (to us) ETAs perform, and taking photos for SIDEBURNS. It wasn’t until the “open mic” closing party event, when I had a chance to talk to Gordon’s road manager, Dave, that the elusive interview showed signs of becoming a reality. Dave suggested we talk to Sandra Gold since she knew Gordon’s schedule while in Canada. Within minutes of talking with Sandra, I had a day, a time, and two pending interviews! The story of Gordon’s interview is only one example of many serendipitous meetings and circumstances that have taken me on an amazing journey. Sometime in the future, I will write about the series of strange events which prove that there was a guiding hand leading to a fortuitous destination. I wish to extend a heartfelt thank you to Wendy for giving me, and all those lucky people who have attended Gordon’s concerts, a chance to relive some special moments. Also, thank you for the great photos, Wendy. Best regards, Carolyn. ETA Gordon Hendricks with Wendy King at the Flaming Star Festival, October, 2017. Photo courtesy of Wendy King. Wendy also wrote the following about another Gordon Hendricks concert. A delightful photo of Wendy King with ETA Gordon Hendricks. Photo Credit: Louis Young. On Saturday 2nd and Sunday 3rd September, 2016 Gordon took to the stage at Stratford Arts House to appear with the Stratford Festival Orchestra along with the Lady Belles and Shout choirs to bring all of their energies to a show which was conducted by Simon Kemp performing Elvis material which, as well as having an epic feel, also lends itself to an orchestra and has rich opportunities for vocal harmony in gospel and ballads as well as the well-known show stoppers. Having the two choirs on board gave full vocal support to the Stratford Festival Orchestra to create two epic evenings that were to say the least sensational. Wendy also wrote about Gordon's Ultimate win. 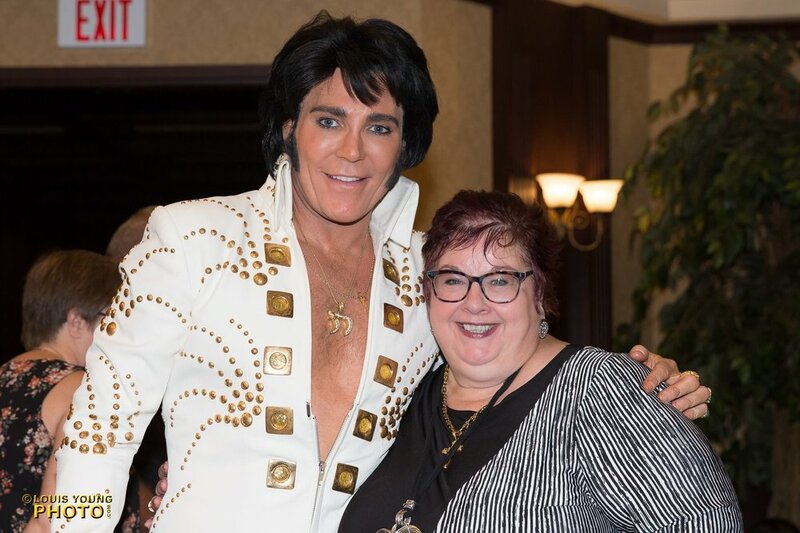 Gordon Hendricks, who represented the Collingwood Elvis Festival, received a contract to perform with EPE, the 2017 Ultimate Elvis Tribute Artist Contest Belt and a cash prize of $20,000. On the 40th Anniversary of Elvis’ passing Gordon became only the 11th ETA to win this contest which confirms him as the World No 1. Gordon won Collingwood Festival in 2017 & 2014 and is the only ETA in the WORLD to win this prestigious festival TWICE. On Saturday 7th January 2017 at the Forum Theatre, Hanley, we will have a launch evening where you will see Gordon as himself fulfilling a life-long ambition to present his favourite songs in very simple acoustic arrangements that you will have never seen or heard before. You will be stunned by his arrangements of favourites of “In the Ghetto”, “Welcome to my World”, “I Just Can’t Help Believing”, “It’s Only Love” and many more of your favourite songs.